For this master bath renovation, I envisioned calm, quiet, peace and serenity– a clean spa-like environment. My selections were driven by elegance of form, texture and simplicity. Because this is my very own bathroom, I had the rare luxury to ponder and explore a variety of options over an extended period of time. 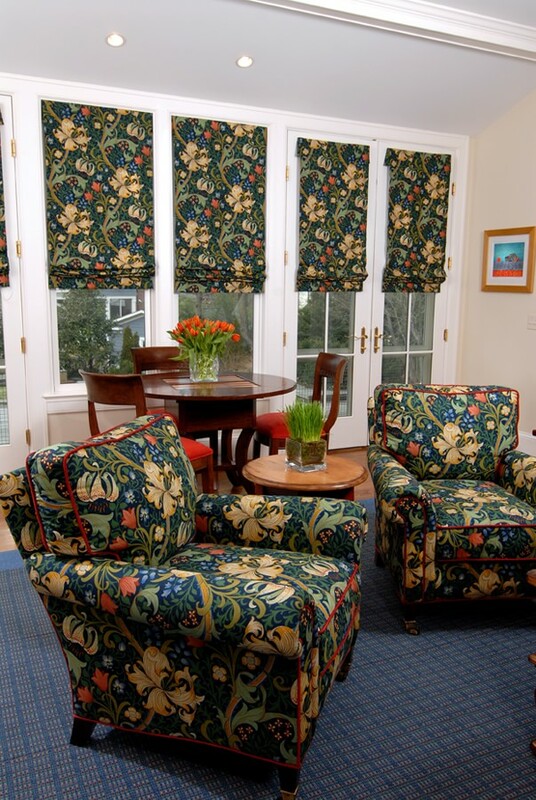 In some ways, I struggled– My designs often emphasize color and pattern. Therefore, keeping the design very quiet with refined clean components was a satisfying challenge for me. I contemplated the revised layout of this bathroom for ages. To eliminate the bathtub or not? To keep two sinks, or just one? 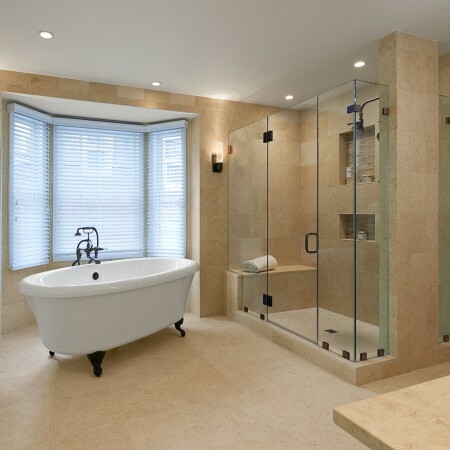 Ultimately, I decided that we never use the tub– so added space for a roomy shower would be a blessing. We DO use the two sinks, so I kept those in the final design. One selection influenced the next. I first chose the simple striated gray and white porcelain tile in plank and subway tile shapes for the main bath floor and shower walls, along with the mosaic accent tile for shower floor and niches. The soft grays and subtle whites then influenced my other selections in terms of color palette and overall feel. The clean, curvilinear lines of the Graff faucets inspired me to select the elegant shape of the Italian blown glass sconces. 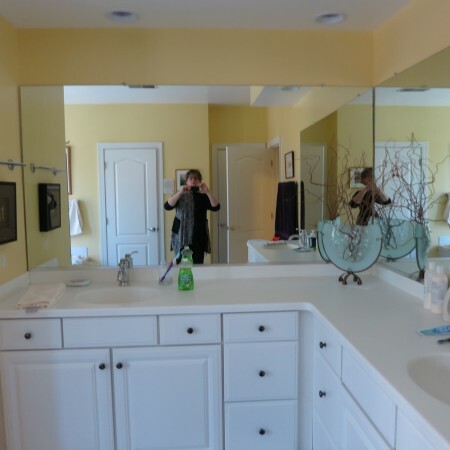 I envisioned clean-lined rectangular porcelain sinks that mounted above the counter; the final sink selection was reality-based– these sinks were lovely AND available within the necessary time frame when others I’d selected didn’t arrive as ordered! The cabinetry is a dark, rich textured veneer. The center drawers actually pull out as one deep full clothes hamper. The quartz counter top perfectly complements the soft whites and grays of the tile. 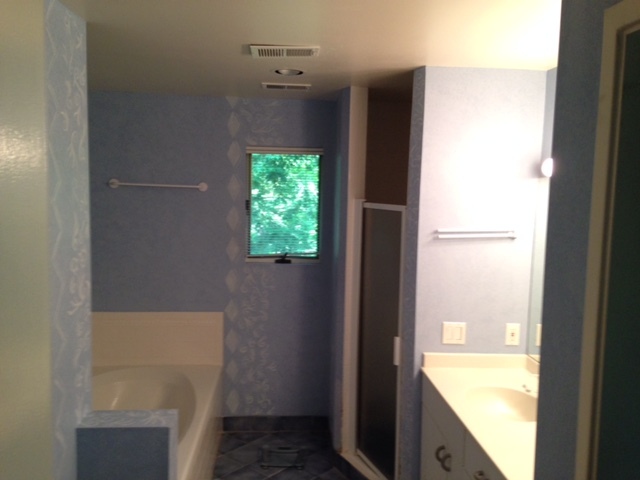 Once final art and decorative elements are added, I promise to provide some updated photos of this bathroom. It’s a joy to use the new space, and I will continue to contemplate the final decorative elements for a bit longer. There are many people whose expertise and support played into this renovation. 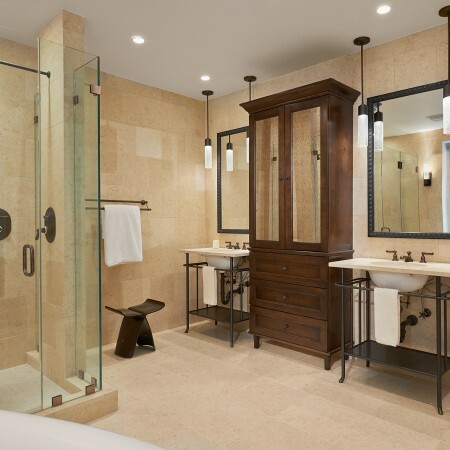 As a Bethesda interior designer and contented client, I’d like to thank Damien Jones of Executive Design Build for his diligent work in making this bathroom a reality… Will Moser of Thos. Somerville, whose knowledge is always invaluable in selecting bathroom fittings… Stacey Alas-Roque for tile and cabinetry… Linda Gombos of Annapolis Lighting for her well-informed support as well. 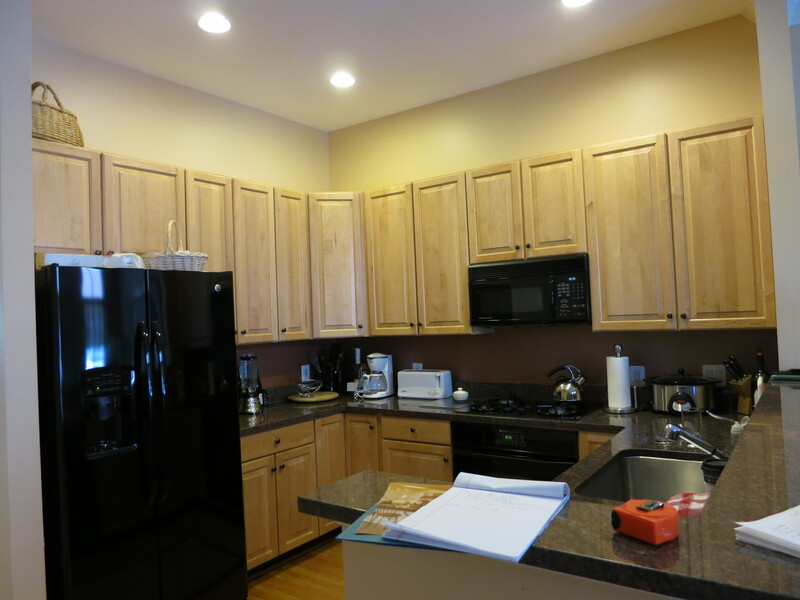 Everything about this dated townhouse kitchen in Bethesda, Maryland needed to be updated— from top to bottom! Space needed to be optimized, appliances and surfaces updated. The homeowners envisioned a colorful and craft-filled kitchen, with quality appliances and workspace that could welcome two active cooks in a small area. 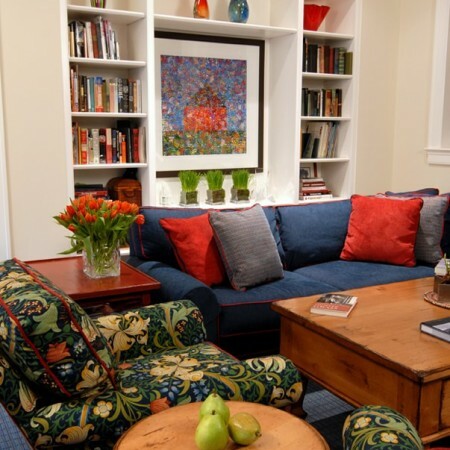 These factors inspired the design of this intimate yet guest-friendly space. Washington D.C. based designer Carol Freedman of Carol Freedman Design selected three unique, upcycled pendant lights as a key decorative element. These whimsical pendants were made from recycled soda bottles and straw by the Columbian Esperara-Siapadara people; the indigenous people use fibres from the papa tetera palm tree, which they dye using natural pigments for application in their traditional crafts. The kitchen has beautiful clean wood, granite and glass surfaces, accented by hand-crafted blown glass art pieces from the homeowners’ collection. 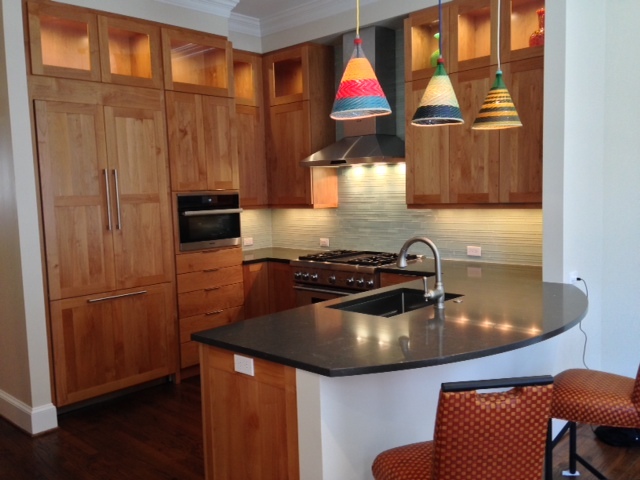 The kitchen was designed in collaboration with Gilday Renovations Design Build in Bethesda, Maryland. 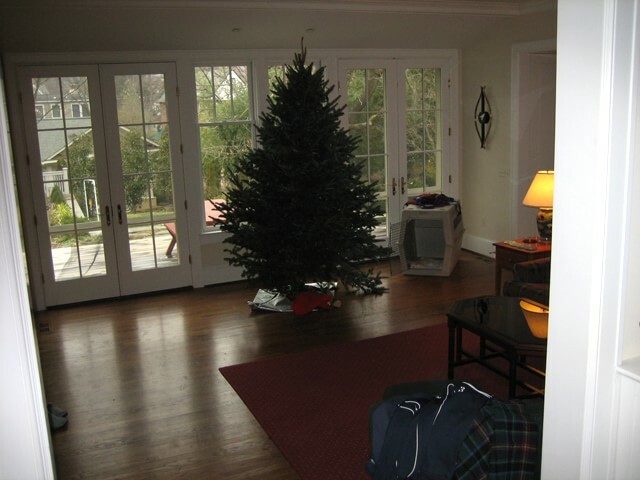 The “after” photo was taken by Anice Hoachlander of Hoachlander-Davis Photography. 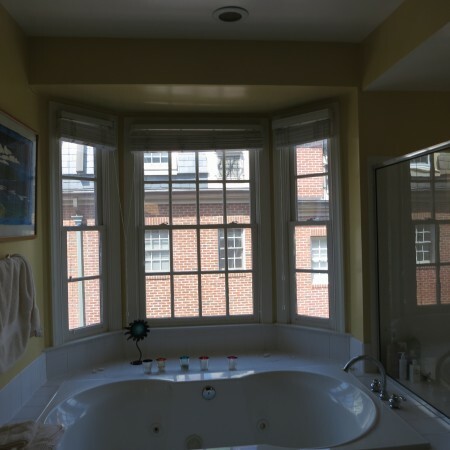 For this master bath renovation in downtown Bethesda, absolutely nothing from the original bath needed to be retained. The spacious area was dated, the layout was uninteresting, and soffits, cabinetry, plumbing— all begged for a thoughtful and creative design approach. The well-traveled homeowners envisioned a master bathroom with spa-like serenity and luxury; elements of the design were inspired by their world-wide adventures. First, their desire for a shapely, free-standing bathtub with classic fixtures was prompted by a tour of the Moulin de la Tuilerie, the former Duke and Duchess of Windsor’s post-abdication retreat outside of Paris. The layout for the washstand area of the master bath was inspired by the couple’s travels to Bora Bora, where the homeowners had enjoyed a suite with a dramatic blend of earthy woods and metals, along with pendant accent lighting. Reflecting these sources of inspiration, the designers included a rich array of luxurious elements, achieving a soothing, spa-like atmosphere. The rich and varied shadings of Hebron Gold limestone, utilized for all walls and floor surfaces, provides an ideal backdrop for the space. The Bain Ultra bathtub and Perrin & Rowe Edwardian style bath and shower fittings precisely capture the aesthetic from the French retreat which had captured the homeowners’ imagination. Beaded glass and the antique bronze patina in accent lighting and accessories complements the ageless quality of various selected materials. This ageless quality is further reflected in the custom wood mirror frames, as well as the antiqued mirror and burnished dark wood of the bespoke chiffonier, which was designed to serve in lieu of medicine cabinets or other drawers in the unusual space. 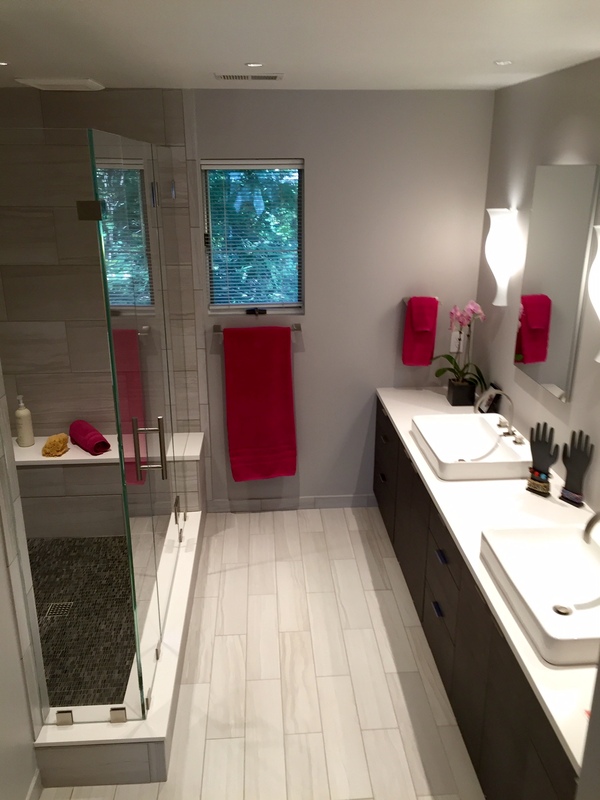 This master bathroom was designed in collaboration with Gilday Renovations Design Build in Bethesda, Maryland. 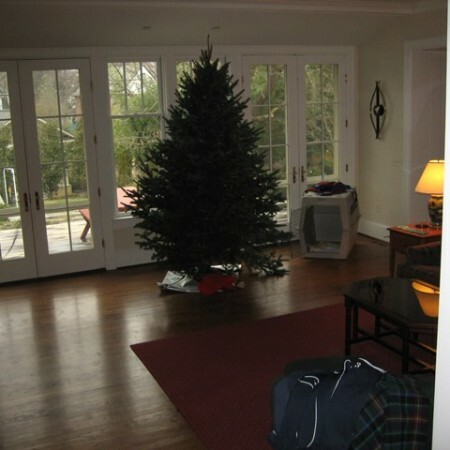 The “after” photos were shot by Anice Hoachlander of Hoachlander Davis Photography. 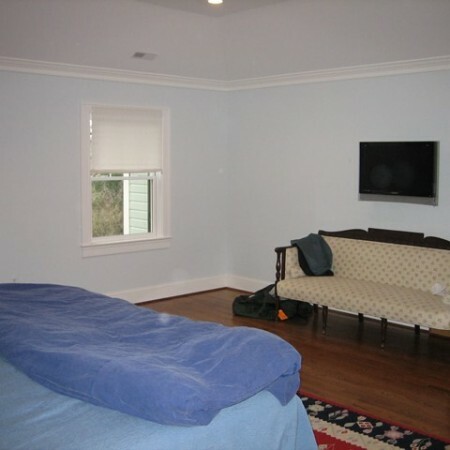 Only the ethereal pale blue wall color and the wall-hung television monitor were “keepers” in this Chevy Chase master bedroom. The transition from “before” to “after” is pretty startling. First— one can see what a difference window coverings can make in the impression of a window’s overall size and appearance. 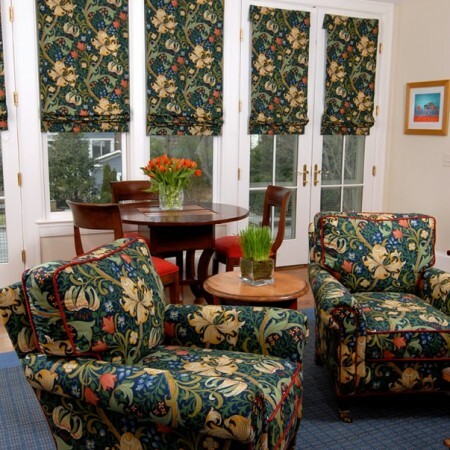 Side panels hanging mostly outside the width of the window, and hanging almost from crown molding to floor, give the impression of a much larger window… in addition to offering color, pattern, warmth and contrasts…. 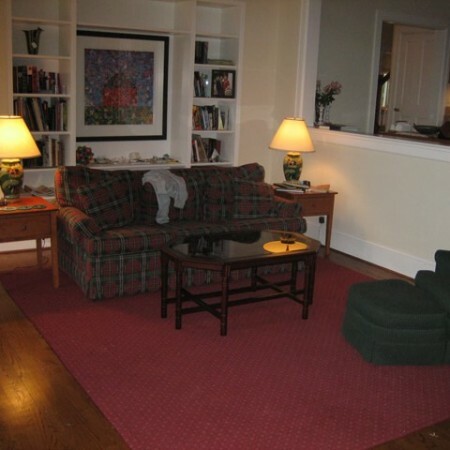 A large Wilton area rug covers much of the room’s wood floor, and the corner is defined as a sitting area with a chaise, lounge chair and ottoman, as well as a warm wood and cane side table. Outside of view is a custom built media cabinet to conceal the television screen, a couple of lustrous wood bureaus, as well as a spectacular four poster bed, side tables, and loads more well-dressed windows…. The room went from Spartan to spectacular— a private haven for the homeowners to enjoy. 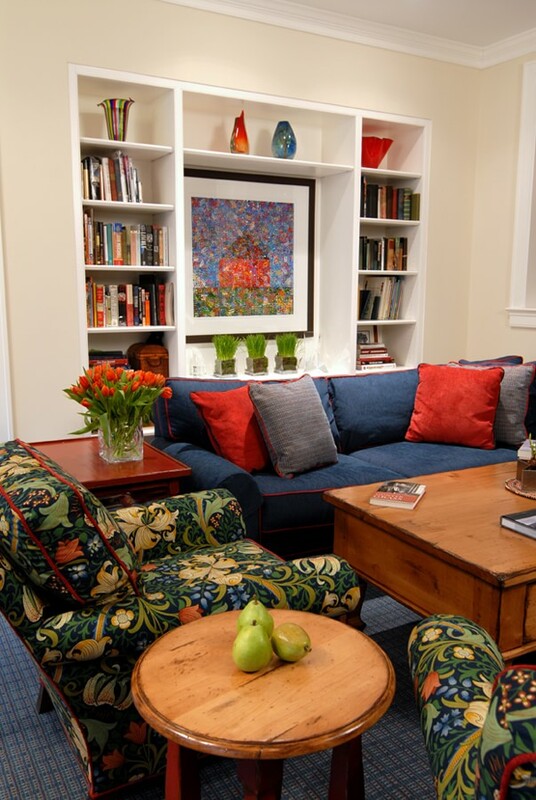 In this Chevy Chase family room, the “givens” designated by the homeowners were the built-in bookcases, the lithograph and the wall color— everything else was ripe for change. The room is a pale yellow (which doesn’t show all that well in the photos!) The homeowners wanted a room that would embrace friends and family for relaxing, playing games, visiting and hanging out. 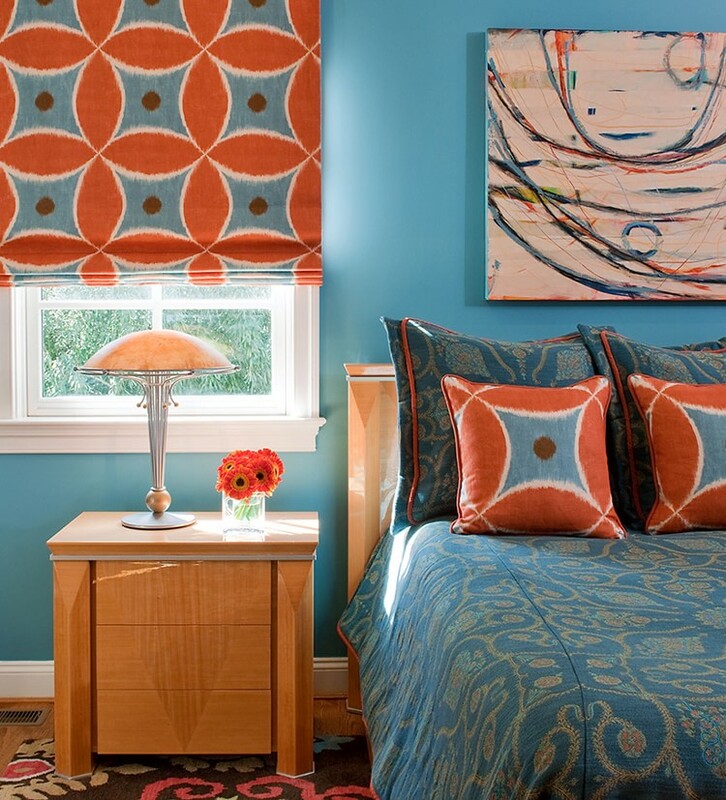 The artwork provided the springboard for room’s color palette— the rich bouquet of greens, blues and oranges was such fun to work with. 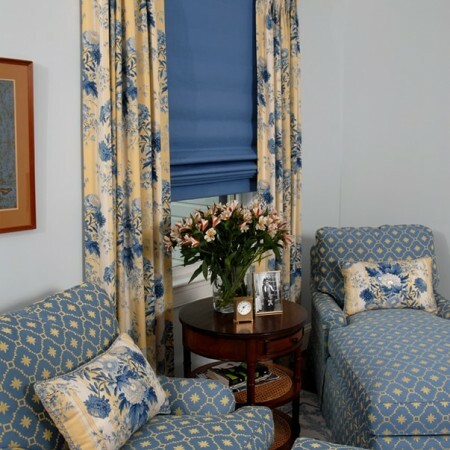 The classic William Morris fabric shown on the lounge chairs (also used for custom roman shades on the windows and doors) brings in the colors with a burst of vibrant patterning as well… To offset the floral fabric, I chose cozy cadet blue and vermilion chenille fabrics for the sectional. 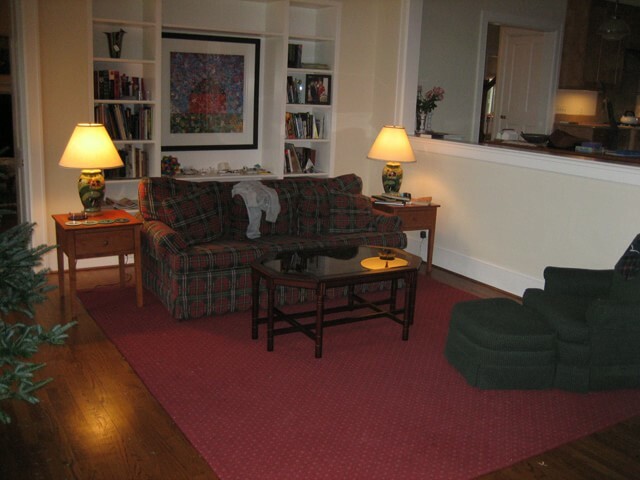 The area rug from Stark Carpet bears a plaid pattern that brings in the same colors as well. The warm tones of natural pine and painted woods add depth and texture to the mix. How does the design process evolve? In my view, the design process evolves differently every single time, based on “givens” (items that the client wants to re-use), client objectives and preferences, the layout and “bones” of the room— and more. In this master bedroom, you see the same nightstands, same bed, and same table lamps… But what a transformation! 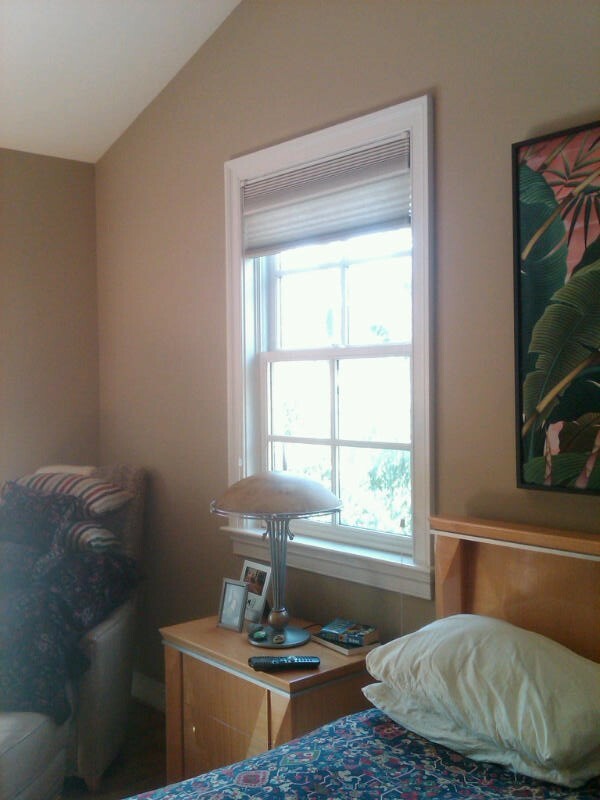 The wall color in the “before” photo does not flatter the distinctive wood furniture in the room, nor does it work well with the natural light pouring in the windows. I suggested that a bold blue backdrop would effectively complement these elements. 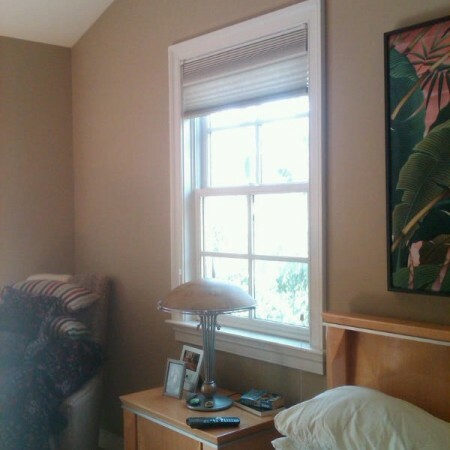 The window shades in the “before” photo clearly don’t provide any drama or warmth, nor does the bedding. 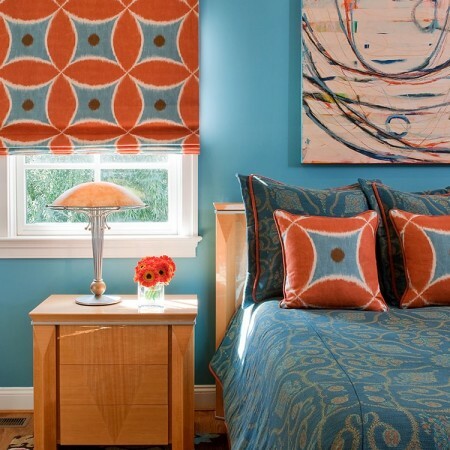 By using a large colorful geometric fabric, the window treatments and throw pillows add a bold, fun design element to the room. In the after picture, the wall color plays magically off the fabric choices, and the Company C area rug and custom painting by Susan Finsen provide contrasts in scale, accent, and color. Just a few changes, and what a dramatic result!